After four years with Pony, United went with Olympic Sports to produce their kits for the next two years, and extended their deal with Telewest for a third consecutive year. The Away kit was a white version of the Home strip, with the same black flashing on the left shoulder, the jagged swoosh pattern at the bottom right, and a repeat of that pattern on the reverse of the shirt, appearing at the back left. The collar differed slightly with the overlapping V neck replaced with a V inset, although the turnover collar remained. On the front of the shirt, the new larger Telewest logo appeared as large black text alongside a more defined green sphere. With the introduction of the SPL, this was the first season where squad numbers were issued, and players names also appeared on the back of the shirts. The white shorts had a black and tangerine pattern similar to the top, at the bottom left. Occasionally, the home shorts were worn with the Away kit, depending on the opposition’s colours. The white socks had tangerine trim and a band across the shin of the same colour. The Away kits competitive debut was the 0-1 defeat to Motherwell at Fir Park in August 1998, a result that was followed by the resignation of manager Tommy McLean after a bad run of form that had continued over from the previous season. Legendary ex-United player Paul Sturrock took over after leaving the managers job at St Johnstone, but United still only managed a 9th place finish, just 6 points above relegated Dunferlmine in the first ever season of the SPL. 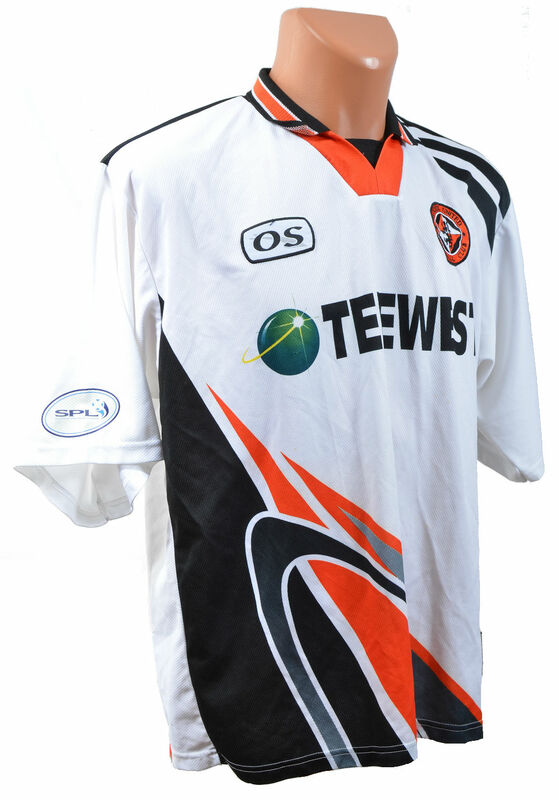 Although the Home kit changed for the 1999/00 season, as well as the release of a commemorative top to mark the Club's 90th Anniversary, the 1998/99 Away top was carried over into a second season, but was used only occasionally as the new Home kit clashed less with the likes of Motherwell & Aberdeen than it had in the past.